You will never see this math problem showing up in the Common Core curriculum. When one adds the plummeting price of oil, to the falling price of gold, what does one get? The answer is “economic collapse” followed by martial law and World War III! Crude oil fell below $70 for the first time since June of 2010. On Thanksgiving, the WTI futures fell to a low of $68.90. This represents 6% decline in a period covering the last 24 hours. In fact, the price of crude oil is down over 25% in the last 50 trading days. According to Business Insider, the recent slide in oil prices has been attributed, among other things, to a global supply glut. At least, that is what the Federal Reserve would have you believe. It is not the truth, but that is what the Federal Reserve would have you believe and they own the media and Wall Street, so good luck trying to get confirming information. Why is the Federal Reserve so concerned with the price of oil? And why should you be so concerned with the price of oil? This article will answer both of these questions. Why is the price of oil falling like a rock? The short answer is that the price of oil and the value of the dollar are joined at the hip. Because, until just recently, if a nation wanted to buy oil, they had to buy Federal Reserve dollars first in order to complete the purchase. IF a destabilization in either the price oil or the value of the dollar occurs, both will collapse. And the BRICS already invested in gold, and they will be there to pick up the pieces under the leadership of Putin. 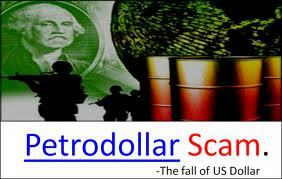 Towards the end of World War II, the Petrodollar replaced the gold standard in the United States. The United States has debt, crushing debt, which makes the former Weimar Republic look solvent by comparison. Unfortunately, the United States abandoned the gold standard a long time ago. What then keeps our economy from degenerating into a trading and bartering society resulting from a collapsed dollar? The United States’ previously good economic fortune is due solely to the fact that the world must use the dollar, the Petrodollar if you will, in order to make their nation’s individual oil purchases and this provides the only source of backing for the U.S. dollar that the Federal Reserve requires in order to somewhat sustain our back breaking debt that the banker occupied United States government has passed along to the American taxpayer in the form of bailouts. Despite the economic pain associated with the enormous debt caused by the Wall Street contrived Ponzi schemes associated with the now infamous derivatives, America’s economy has proven to be very resilient. However, if the artificial global dollar demand, made possible by the Petrodollar system, were ever to crumble, our days of economic dominance would abruptly end and the resulting economic chaos would be followed by the need to impose martial law on a starving public. Again, tens of millions of Americans will die in this scenario. Unfortunately for every man, woman and child in America, that day of economic reckoning is quickly approaching. Two years ago, China commenced buying Iranian oil in gold. India has followed suit, as have the Russians. The days of the Petrodollar are numbered and therefore, so is the only source of backing of our dollar. The BRICS are trading with each other in gold and forsaking the dollar altogether. Get out the shovels, it is time to bury the dollar. Have you and your family prepared for the collapse of the dollar and ultimately the collapse of society? Like most Americans who have awakened from their slumber, I came to realize that the Federal Reserve Board is responsible for most of the evil perpetrated in the world and I personally loathe the organization. It is hard not to cheer the fact that the days of Federal Reserve Board dominance may be coming to an abrupt end. Yet, I would advise against popping the corks on the champagne bottles because, like it or not, America’s economic fortunes are tied to the health of the dollar and our precious dollar has come down with a terminal economic case of the Asian flu. If the Federal Reserve crashes and burns, so will everything that you have ever worked for. 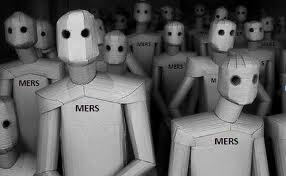 If the Federal Reserve collapses over this impending crisis, the resulting economic holocaust will make the United States unrecognizable within a very short time and your personal fortunes will sink right along with these notorious robber barons who are feverishly involved in stealing as many home mortgages as possible through schemes like the robosigners of MERS. The Federal Reserve, the same people who perpetrated the MERS fraud, is also involved in buying up mortgage backed securities in an attempt to garner the lion’s share of the housing industry. And if you didn’t hear, the Seventh Circuit Court of Appeals made it legal for the banks to steal your deposits. As I reported on November 16, 2014, the G20 nations declared that your bank deposits are no longer considered money, thus, making it far easier to steal in the midst of a banking collapse which is coming. Don’t think for a moment that these events are not contrived by the bankers to get as much as they can, of the public’s assets, in as short of time as possible in this time of crisis. The banksters clearly know what is coming and they are in the process of stealing your assets in order to soften the blow of a collapsing dollar and their “Golden Parachute” will be awarded to them courtesy of your hard earned assets. Surely, there must be something that can be done to avert this coming train wreck? Can’t the United States simply employ economic sanctions and force Iran and the other BRICS to their collective knees? If the United States seeks to reverse the trend which seeks the abandonment of the Petrodollar system, war seems to be the only option left to the bankers. Logic would seem to dictate that the military option will be employed and therefore, it should be a simple matter to ratchet up the rhetoric and seize the Iranian oil fields and force capitulation. However, this would also involve breaking the back of Russia, China and India and that would have to involve a devastating third world war. If one does not think that the recent events related to the death and subsequent riots caused by Michael Brown’s death are not related, think again. The government is practicing for the implementation for martial law in anticipation for the total collapse of the dollar. Also, the events in Ferguson are a great distraction for what is going on economically. For that matter, so is the Department of Homeland Security with the acquisition of 2.2 billion rounds of ammunition and 2700 armored personnel carriers are also signs of what is coming. The firing of American military leaders at an unprecedented rate, is also related. So is the firing of Chuck Hagel as the Defense Secretary for his refusal to go along with Obama’s martial law plans. Obama is getting rid of all military leadership that is not on board with the collapse of the American economy and the installation of the new American management team, otherwise known as the New World Order. I want to emphasize that the confiscation of America’s wealth is already underway in earnest. It is not a tomorrow thing, it is a yesterday thing. Besides stealing America’s personal assets related to retirement accounts, bank accounts, home mortgages, etc., one would think that the elite would be looking for a place to invest their assets. For when the smoke clears, where will the elite have placed their investments? After the coming collapse, the elite will own nearly all personal and business real estate and personal assets through confiscation. In short, the elite are putting their new found assets into various forms of gold, hard gold, the kind of gold one can touch with their greedy little hands. You might be confused on why gold prices are falling so dramatically. Well, it is all part of the plan. According to NASDAQ. 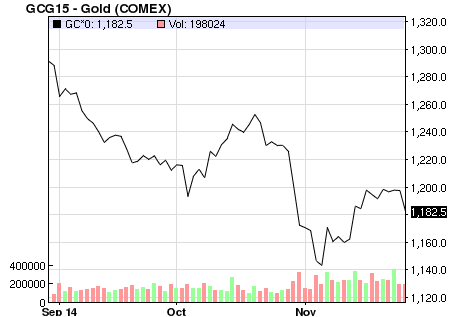 Gold Comex prices have been dropping like a lead balloon. One could look at gold a million different ways, but let’s suffice it to say that gold prices are far lower, dropping like a rock and the investment into gold looks risky. However, the opposite is actually true. The drop in prices does not mean that you should not buy gold. In fact, if one thinks that the dollar is on life support, now is the time to buy gold and one should buy a lot of it. 1) Keep the price of gold artificially low so that the elite can afford to buy as much as they can. 2) Buy as much gold as they can for the purpose of being able to economically compete with the BRICS after the collapse of the dollar. 3) Survive the post-apocalyptic period that is coming following the collapse of the dollar, the implementation of martial law followed by World War III. In other words, gold is a long term investment strategy. These three goals were acted upon by Goldman Sachs in March of 2013. At that time, the market clearly showed signs of mass manipulation by the Globalists. The best proof that the globalists have been manipulating the price of gold comes from “Goldman Sachs (who) reportedly told their clients in March of 2013 that they recommend initiating a short COMEX gold position.” This was designed to get the public out of gold investments and to open the door to the elite hording the same asset. As an aside, whenever Goldman Sachs shorts anything, we better collectively watch out because something really bad is about to happen. Previous Goldman Sachs “shortings” led to 9/11 and the Gulf Oil Explosion in 2010. The manipulation of gold not only lowers the price of gold for the elite but it is their final investment hedge against the coming collapse of the dollar; it also discourages the average person from making the same investment because of the artificial conditions leading to the dropping prices. Further, less healthy nations, from an economic standpoint (i.e. the BRICS) will feel their gold investment destabilize under the weight of falling gold prices, while the elite can whether the storm. 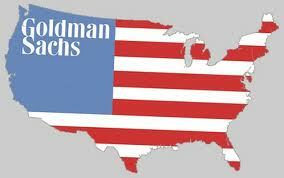 Meanwhile, welcome to the new United States of Goldman Sachs. One should buy gold, as much as one can afford. No you cannot eat gold, so you better have enough survival resources (God, guns, ammunition, food, water and neighborhood allies) on hand to whether the coming storms. However, there are two storms that we are all going to have to survive and they are martial law and World War III. Putin knows that the Federal Reserve/Goldman Sachs gold strategy is threatening his economic viability as Russia leads the charge to a return to the gold standard. Wars have been fought over lesser things and World War III is coming and Putin is preparing for this eventuality. This will be the topic of the next part in this series.